1. Paint your tp roll and let dry. 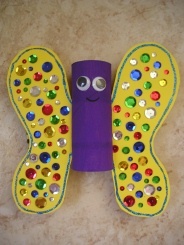 Place on construction paper and draw your butterfly's wings around your tp roll. When you cut your wings out they need to be one piece, since you will be sliding your wings into the tp roll. 2.Decorate with markers, glitter glue, sequins, stickers or anything you have around the house. Do not decorate the middle of the wings since you will be sliding them into the tp roll. 3. Cut 2 slits in your tp roll, opposite each other. Slide your butterfly's wings into the slits.